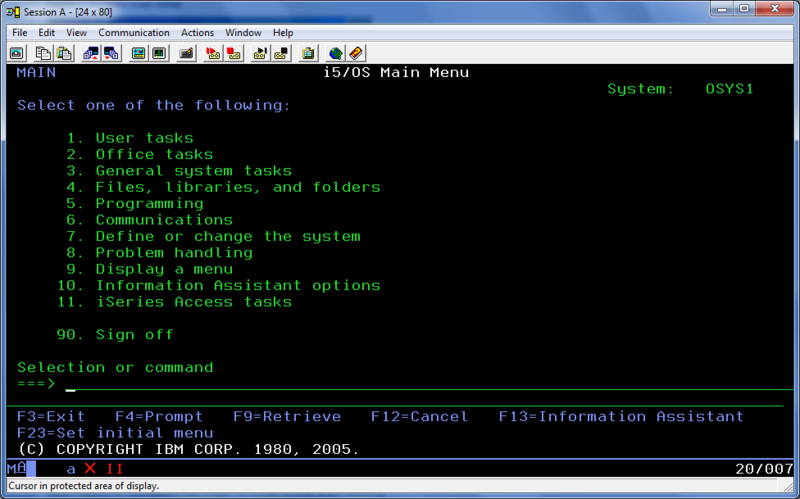 The 5250 terminal emulator, or green screen, is your interface when working with an AS/400. Here is its main menu. If you enter an illegal keystroke, a red XII appears, as shown in the screen above. Press the Ctrl key to clear it. To use function keys above F12, press the Shift key simultaneously with a function key; for example, for F16 press Shift and F4. All commands are menu driven, or you can enter them on the command line. Use the Tab key to move to the underscored areas that designate input, or click them with your mouse. You will use F3 and F12 quite regularly to back out of a menu, to navigate back, or to “close” the screen you are on. Press F1 on any field for context-sensitive help. If you don’t know the name of a command, type the first few letters followed by an asterisk ( * ); for example, type STR* to list all the commands that start with STR. To list the options of any command, type it and then press F4. The name of the menus will sometimes be listed in blue in the upper-left; to return to them, enter GO MENUNAME. Commands will also sometimes be listed at the top; to use that command again later, just enter the command. To stop a command that is hung, right-click the screen, click SYSREQ, press Enter, and then use the Menu to end the command. Below figure shows a normal Sign-On screen. The upper right corner of the sign-on screen displays information that identifies the system, subsystem, and display device(or display station). A display device is the workstation hardware (monitor and keyboard) that you use to communicate with the system. To sign on and start an interactive job, a user must type his or her username and password. A user name is one to 10 characters long; the security administrator determines its value according to the standards of the installation. The user name may be a simple first initial and last name combination, such as YRANGANA. Or it may be a more symbolic code, perhaps indicating the user’s location or department. Press <F3>until you see a command prompt, ===>. At the command prompt type SIGNOFF or 90.